12v-24v DC 30W LED Floodlights are go! Our new 12v – 24v DC 30W LED floodlights are now available! Our new premium grade DC led floodlights are finally through development and are available right now from the OnSolar.co.uk website. This new 12v 30w floodlight is quite a beast and better still with the ability work with a 24V DC systems with no alteration. In essence the new lamps use a specially developed circuit which internally selects and adjusts to the operating voltage. Looking good! The finish is improved with a high grade gloss black pain electrostatically applied. Now producing an incredible 2900 lumen, the new floodlight is very powerful and so is useful for a multitude of off grid DC powered lighting projects. It has taken some time we have to admit, but we are now very proud to anounce that we have now finished deveopment of our 30W LED universal voltage DC floodlights. 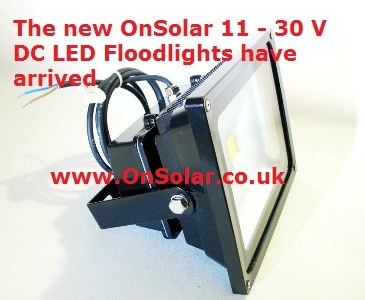 These new 30W 11-30v led floodlights are now available for the OnSolar website! We want to thank all those customer who have been waiting patiently for them to arrive. Our new lamps are powered by a special driver circuit which we have designed to allow the LED to start softly to ensure a long life without premature failure. The device can automatically detect supply voltage 12v or 24v. The new lamp is fitted with only premium componets including an Amercam sourced LED chip, high grade driver (specially developed for / by us), highest quality aluminium castings for the lamp body and of course HO5 grade 2 core cable. 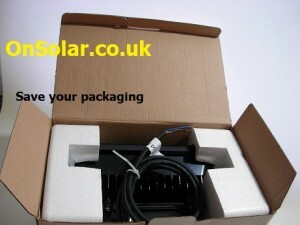 If you liked our new 12v 30w floodlight, Take a look at the OnSolar blog now to see if you have missed anything!